I thought I'd share a few things that have been happening at our house. Harper had her last day of MDO this week. This was her first day and her last day of school. I can't believe how much she has changed in just 9 months! She looks so grown up to me now. 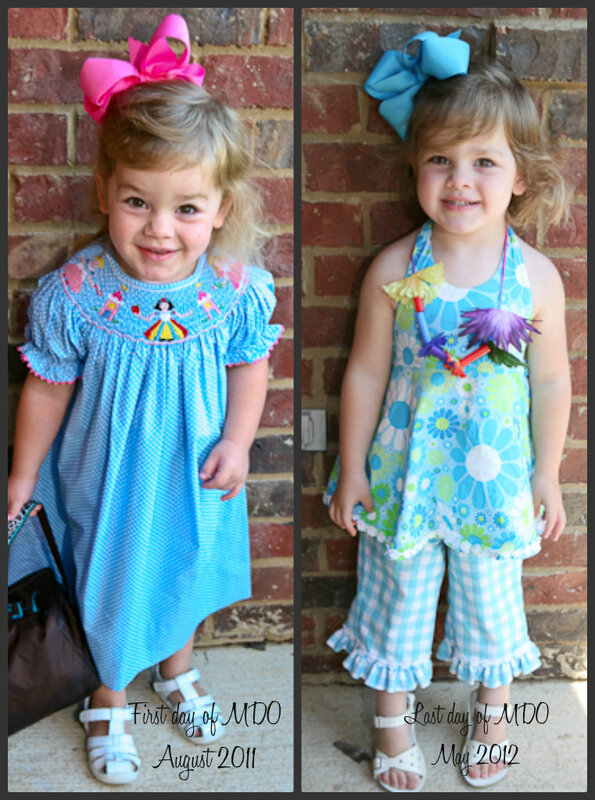 She is starting preschool this year and I'm so excited for her! It's just so hard to believe how quickly time flies! I have a new "job"!!! I'm going to be blogging for the local news station. I'm excited to share that blog with y'all! I know a lot of you live in Arkansas or in NWA and I'm excited to blog about what makes our little corner of the state great! I'm hoping y'all will chime in and I'm hoping to find ways to interact and help promote great blogs, restaurants, stores, etc in this area! If you don't live here - you might want to visit one day or who knows - you may even find yourself moving here one day! I'll also be on KNWA every Monday morning between 6:15 - 6:45 to talk about the blog! (yikes!) I think this is going to be a really fun experience! Stay tuned! I'm starting this week so I'll be writing more about it soon! 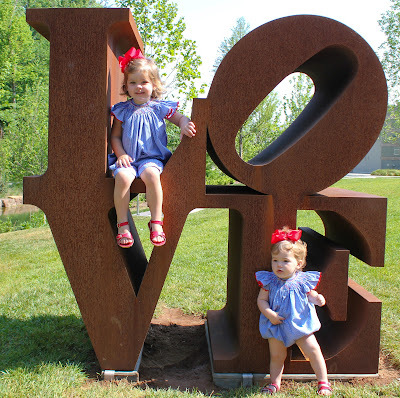 Our museum got a new "love" statue on it's lawn so we checked it out this morning. I LOVE this nation and I'm thankful for all the women and men who died so we could have a great life. I LOVE my Jesus and I'm thankful He died so we could ETERNAL life!